We heard about Windows Blue last week, and while the info was sparse, some of it sounded pretty solid. We like the idea of a yearly update cycle for Windows, much like what we see in mobile, and with MacOS and many Linux distros. We like the idea that it could initially be free, and more solidly unify mobile and desktops. And now, there is a rumor that the update could help add support for 7 and 8" tablets, which are sorely lacking in the Windows ecosystem. Windows 8 and Windows RT has done well to add plenty of 10"+ tablets, hybrids, and transformers to the mobile landscape, but not everyone wants a mobile device that big. As Google, and Amazon have proven, there is a large market for tablets around the 7" and $200 marks. We heard about Blue via The Verge, and this new info comes from the same source, although what's odd is that the statement was something of a throwaway, with no credit given. In the original piece about Windows Blue, there was no mention of optimization for smaller tablets, but that info was dropped into an editorial about the Windows brand name. It's an odd way to present the info, but The Verge tends to have good sources. And, we'd like to see Windows on 7" tablets, if for no other reason than to add more competition to the market. They can keep trying till they succede (or fail finally). yeyyy!!! now im so excited for the surface RT 2!!! rumor has it is that it is 8.6" which is a best size for people who likes a tablet that isnt huge and not small too! and im one of them! cant wait for this!!! im wishing that microsoft will bring HD screens now! and still hoping for cheaper price!! but also, waiting for what could nokia bring in tablet space as well! For me it's Surface Pro , which is rumored to be running on an AMD processor. AMD really know how to do graphics better, Intel doesn't. How does the Blue plan differ from Service Packs currently in place, excepting regularly scheduled updates? I hope android will be more popular. Just I don't want monopolistic bald guy to rule the world again. Android nowadays looks like windows of old days with great flexibility. If some people think that android is to complex for them, please Let them use windows. Maybe this bald guy will think what way their smartphone / tablet must look like. In my opinion, just as 95 transitioned to 98, then 2000, XP to MCE, then Vista to 7. It's just the beginning with 8. Folks I am not in shock that Microsoft will put Windows 8 on 7 inch or 8 inch Tablets because Microsoft is said to be going to start selling a portable Microsoft XBOX gaming tablet. also Microsoft has a deal with Barnes and Noble so look for a Barnes and Noble 7 inch tablet running Windows 8 or Windows RT with an E book store and Xbox game playing capability selling for 200 dollars. Frankly when this Tablet comes to market I hope that it is running Windows 8 not Windows RT. look for it to be the big announcement at CES next month. folks the New Barnes and Noble 7 inch Nook HD already has the screen resolution to run Windows 8 but needs a version of windows 8 that can be run on the CPU and it's chipsets that are used in the new Current Barnes and Noble Nook HD. 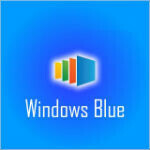 Windows Blue to replace Windows 8.